When I walked into the shop of Shearwater Organic Coffee Roasters in Trumbull, CT, I felt like a kid in the toy store. It was all about coffee – the smell, the coffee makers, huge bags of coffee beans – it was all coffee, coffee, coffee. Shearwater Coffee Roasters has a very simple mission – to let people experience the best possible single origin organic coffee, one small batch at a time. This is a loaded sentence, so let me explain it in a few more words. Let’s start with “organic“. All the coffee roasted at the Shearwater is USDA certified organic. The coffee comes from all of the world, from Guatemala., Colombia, Ethiopia, Costa Rica and other places, but only from the producers which had being certified by USDA as organic. USDA Organic requirements cover full lifecycle of the coffee production, from the soil and trees handling until the green coffee beans will be packaged for shipping. That organic certification also includes the Fair Trade Certification, which means that the people who grow the coffee are treated properly. Additionally, the Shearwater production process and the whole facility had being also certified by the USDA, so the final product which goes into the little yellow bags is in and out USDA Certified Organic. Now, a few words about “single origin“. The best way to explain the concept is in the analogy with wine – this is the wine blog after all! Single Origin is really an equivalent of the appellation, or in some cases it can equated to the estate or even single vineyard. Same as grapes, the coffee is a product of mother nature – it exist in multiple varieties, and its taste will be affected by the soil type, the climate, the amount of water, the altitude – yes, you can call it a “coffee terroir” – and if coffee beans are treated properly from the bud breaking until it will make it into your cup, you will be able to taste it. 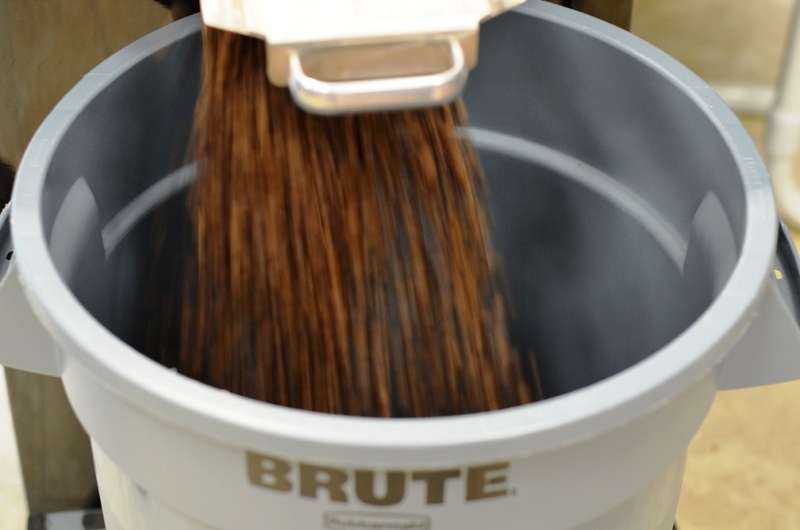 Now, the “small batch“: that simply means that coffee is processed (i.e., roasted) one small batch at a time. How small? 20 pounds to be exact. 20 pounds of fresh coffee beans are roasted at a time. That’s it – only 20 pounds. Working in the small batches, you have much better control over the process, and you can ensure that all the beans are roasted uniformly. And you can also make each batch to taste individually different. Which gets us to the last term I want to explain – “best possible”. 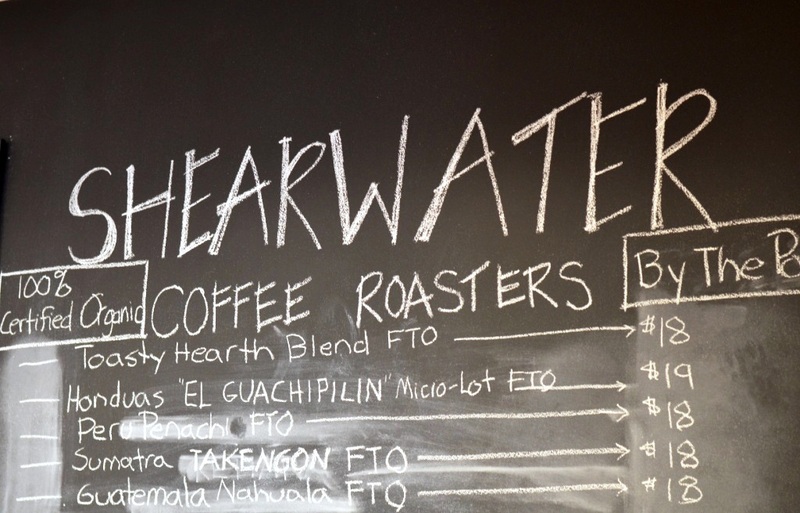 That concludes my story about the Shearwater Coffee Roasters. They are located in Trumbull, Connecticut, so if you live close by or visiting the area, that might be a good place for you to visit (they sell all the coffees and coffee makers right at the shop). If you are not local, but still want to experience Artisan single origin organic coffee at its best, you can order directly from Shearwater web site. I hope I managed to make your Monday morning – no, I can’t deliver the smell, but I hope I gave you enough coffee pictures so you can add the smell on your own. Oh yes, the cup of fresh coffee sounds divine – time to make one. Cheers! Thanks, Suzanne. I’m drinking a cup of Shearwater Kabirizi from Rwanda – very nice! 🙂 Yes, this small batch approach makes a lot of sense to me. Oh my goodness! Yummy! I am not an everyday coffee drinker. I usually save it for Sunday mornings on my screened-in porch, heavily laden with sugar and cream. You just can’t beat the smell of coffee. Thanks for the invigorating post! Thank you! If you have an access to the good coffee (small gourmet store, Whole Foods, something similar), try some medium roast coffee just by itself, without sugar or milk – you might discover the whole new world. I’m purposefully not mentioning Starbucks and similar – their coffee is generally overdone to the point where you can’t taste anything, so trying the mild flavorful coffee from the artisan source might be a good thing. Great! Let me know how this will work for you! A Talk-A-Cappucino post! 🙂 I love the smell of coffee- we get ours from a place called Ritual and they are small batch, fair-trade, from different coffee growing regions, so we always have different beans and you can definitely smell the difference in the different batches. Coffee makes me sleepy 🙂 There’s nothing like the smell of coffee. The best coffee memory is Kenya Royal Pearl or something and another African origin in a cafe in Bordeaux, which was WOW. I’m not a coffee export but the smell is so tempting, except Turkish coffee LOL. Coffee makes me sleepy 🙂 There’s nothing like the smell of coffee. The best memories so far are the Kenyan royal pearl or something and another African origin, which had a sweet nutty aroma. Coffee is so tempting, except Turkish coffee lol. Do you like the Turkish coffee? Or do you not? Well, I will first make sure no spies are around. Ehm, I don’t like Turkish coffee. It doesn’t have the depth in the taste and smell. I drink it only when there is no other alternatives. Great post! I’m writing up a blog post about a local coffee shop and ran across your blog–very informative. Thank you! Glad you liked the post. Coffee is definitely one of my favorite drinks – especially while it is made – I can smell the aroma forever, so I’m always happy to share my passion.